One of the oldest drawing materials in existence, these natural charcoal sticks are made from made from the finest willow twigs. They are soft and very suitable for shading. PITT MONOCHROME natural charcoal are made from specially selected twigs, soft and very suitable for shading. The Pressed charcoal sticks come in five grades of hardnesses, from extra soft to extra hard. Their dense blackness is ideal for heightening shadows and creating clear contrasts. Available loose and in sets. Click here to find out more information about Faber monochrome products. best quality cedar wood. 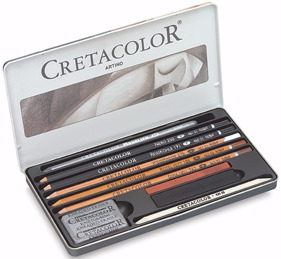 The set contains 5 pencils ranging from Graphite to Sanguine, 1 Monolith Graphite pencil, 2 sketching charcoal sticks, 1 kneadable eraser and 1 paper blending stick.